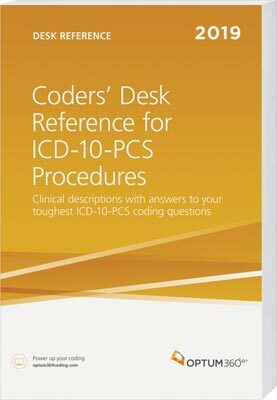 Works with the ICD-10-PCS code book to provide guidance on procedural terminology of ICD-10-PCS. In-depth analysis of all new and changed codes for 2019, with Illustrations and lay descriptions. ICD-10-PCS coding terminology. Because provider documentation often does not reflect the precise terminology found in ICD-10-PCS, correct procedure coding is dependent on the ability of the coder to translate common procedural terminology to the appropriate procedural terminology of ICD-10-PCS. This resource is organized by common procedural nomenclature used in the hospital setting and then linked to the related root operation table(s); the procedure is described in layman's terms, translated to ICD-10-PCS root operation terminology, and the corresponding root operation table(s) is identified. Optum360 Edge — Lay description. Lay descriptions are provided for the most commonly performed inpatient procedures. Corresponding ICD-10-PCS root operations are identified and defined. Optum360 Edge — Clinical focus points. When more than one root operation may apply, key procedural terms differentiating the root operations are highlighted in focus points to ensure that the correct root operation is selected. Optum360 Edge — Illustrations at the code level. Illustrations of pertinent anatomy and surgical procedures are included to enhance understanding. Ease of use. Developed to work hand-in-hand with your Optum360 ICD-10-PCS codebook. Enhance understanding of ICD-10-PCS. The lay descriptions were developed to enhance understanding of the ICD-10-PCS terminology and definitions of root operations, body parts, approaches, devices, and qualifiers. Designed for both novices and seasoned coders. The lay descriptions, illustrations, and other supplemental resources contained in this resource are designed for coders of all skill levels.